As I mentioned here last week, Microsoft have made the claim that their still unreleased Surface tablet/PC device is better at creating than the iPad. Essentially they’ve put forward the tired and absurd argument that the iPad is a device made only for consumption, while the Surface will be for real productivity and creating things. 12 NFL teams, including the Cincinnati Bengals, the Denver Broncos and the Baltimore Ravens, have replaced their paper playbooks with iPads Teams are editing and updating their playbooks continually. Notes and editing are being done on the iPads. The iPad is also being used heavily by teams in the NBA, Major League Baseball, and other sports. A growing number of airlines, including United Airlines, have replaced their paper pilot manuals with iPads. Etihad Airways is using iPads to train aircraft engineers. Both the Polish Parliament and Dutch Senate have substituted iPads for paper printouts of the documents read by their members. The UK’s parliament is also rolling out iPads, and the President of the United States uses an iPad in his daily briefings sessions. represents the tip of the iceberg. 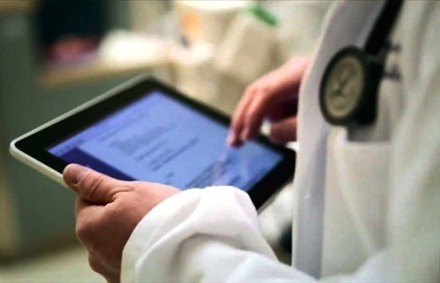 Yale University gives iPads to its medical students. There are great numbers of higher education institutions embracing the iPad. One quarter of European doctors are reported to already use iPads, a percentage that’s forecast to reach two-thirds in a year. There’s a similar rate of uptake in the US and Half of iPad-owning doctors are using their device at the point of care – exam room, hospital, and so forth. SAP has deployed over 12,000 iPads running applications written by the company. And SAP are not known for their light, entertainment apps! Level 3 has purchased 1,300 iPads for its sales force, using applications written by Salesforce.com. As I pointed out in my post last week, the iPad is also being used to create music and great art – and not just by ‘amateurs’ but by renowned traditional artists. Not too shabby for a pure consumption tablet. Really? Everything that you mentioned in this article is consumption …. You just proved the point. I thought the same thing as the first comment; these are all consumption. But none of this actually challenges Microsoft’s claim that Surface will be better than the iPad at productivity tasks. Until I can sit at my computer and treat my tablet as a second monitor, dragging photoshop files back and forth between screens, and seamlessly accessing files off my hard drive . . . I will consider my iPad just an awesome consumption device.